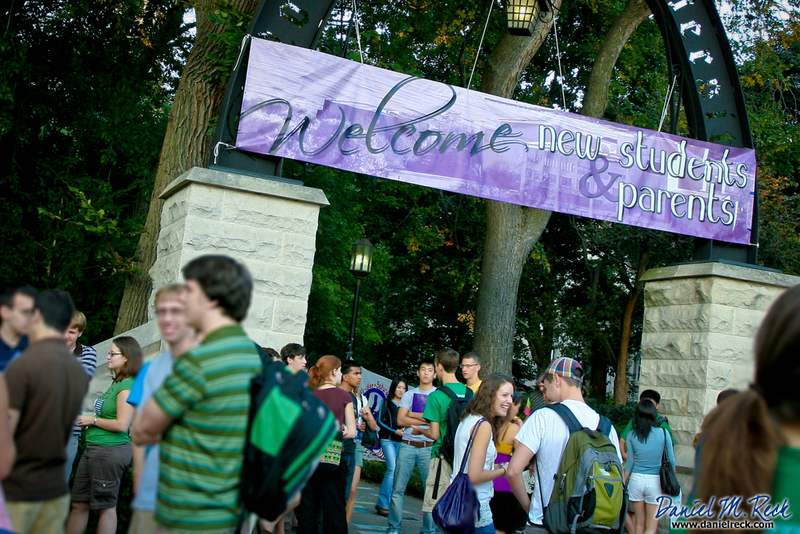 New students arrive at the Weber Arch on the Evanston, Illinois, campus of Northwestern University. Welcome back! Students are returning to campus right about now, and they're looking for something to do. How will they know to join your organization? You're probably dreading having to do all that work to print posters, buy giveaways for the campus involvement fair, and put flyers out in the dining hall. It's a lot of work and it only got a couple of people interested last year. So what's you're group going to do to attract new members? The good news: Recruiting is easy. The bad news: You can't just post up a few flyers and expect people to join. Telling people you're recruiting doesn't work, either. It's tacky. Know your group. Sounds obvious, but it's not. You can't portray your group accurately if your members aren't able to articulate who you are to yourselves. Organizations change over time, so regularly spend some time with your current members and ask, "who are we and what do we do?" Be yourself, publicly. If you ordered a pepperoni pizza and and they instead delivered a bologna sandwich, you'd be annoyed. You probably wouldn't buy from that place again. So why do clubs tell people they are one thing ("We're close friends doing community service.") and then deliver another ("Let's get drunk!") and then wonder why people don't stick around? If you're a service group, do service. If you're an IM team, go practice. If you're the chess club, play chess. If you're a fraternity, support your brothers, do good work, and live honorably. Whatever you do, do what you do where people can see you. Invite people to hang out...but do not ask them to join anything. If someone seems like they might be good for your organization, invite them to do things with your members. Keep it simple and make it easy to say yes. Ask them to join you and some of your members in the dining hall or see if everyone wants to toss a frisbee after class. Introduce potential members to current members and alumni. Everyone wants to have friends and a good network. So provide it. Since people like to do what their friends are doing, and all their new friends are in your group, these folks are going to be thinking about joining your group. Have an event and keep being yourself. Now that you've made friends, it should be real easy to invite them to come to a regular event put on by your group. Don't do anything special. Just invite them to come and let them participate. Afterwards, follow up. See what they thought. And ask them back. You know, like what a friend would do. Repeat. You just got a new member and you never asked them to join. Now make sure everyone in your organization is doing this every day. Want to know a secret? This doesn't take any extra time. You don't have to do anything that you shouldn't already be doing...like eating, going to class, having fun with your friends, and being nice to people around you. Also, this is pretty much free to do. Take the money from the recruitment budget and put it into your event and activities budget so that you can do what you do better. Just by being yourselves and open, and being intentional about inviting the people you know to participate in what you do, you'll have plenty of people asking to join your organization. "Ah ha! That's backwards!" you say. Maybe not. Think about it: If your members are consistent about making friends and inviting them to do the awesome things you do, people will ask to join you. It's human nature.